Easter eggs aren't just for hunting. 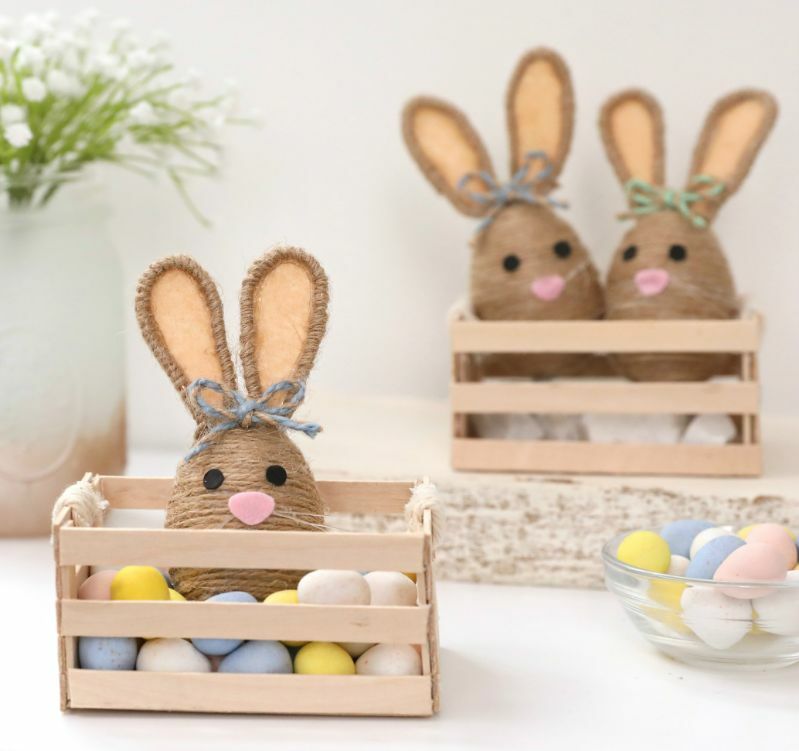 They also make great bases for various holiday crafts, including a twine Easter bunny that adds a fun touch to any room especially a children's bedroom. In a crate filled with candy eggs or other colorful plastic eggs, these rabbits can brighten up a senior or community center, a medical office or your kitchen. The tutorial uses brown twine to emulate natural coloring, but if you want the Easter bunny to be a little brighter, use colored twine. Felt and bow colors are also customizable. 1. Place a dab of glue on the top point of the egg. Press one end of the twine into the glue. Place another dab of glue next to the twine. 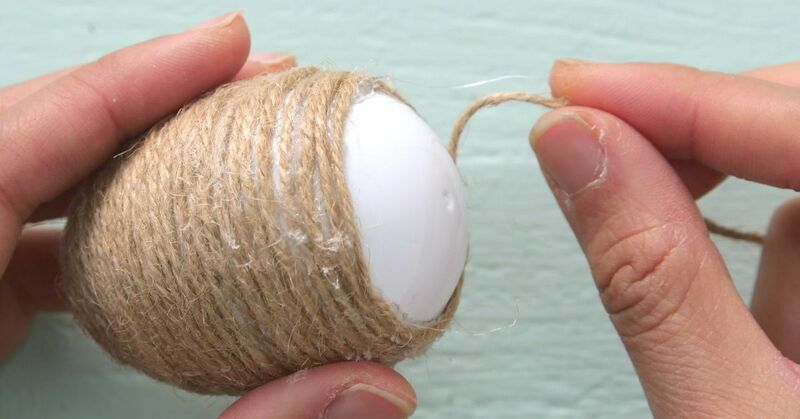 Begin wrapping the twine around the egg, periodically adding glue to keep the twine in place. Cut off the twine when you have fully covered the egg. Glue the tip in place. 2. Measure out and cut off 8 inches of wire. 3. Place a dab of glue on one end of the cut wire piece. Wrap the end of another piece of twine around it. Continue to glue and wrap the twine around the entire length of the cut wire. Cut off the excess twine when done wrapping. 4. Fold the wire in half so it looks like a pair of chopsticks. Turn the wire so the two ends point up. 5. Take the right side of the wire and curve it down to the right until it forms a loop. Do not close the loop at the bottom; leave it open approximately 1/4 inch. This is the right ear. Repeat this step with the left side. 6. Place the "ears" on the peach felt and trace along the inside of the ears. Cut around the outside of the marks. Apply glue to the front edges of the felt cutouts and attach them to the backs of the ears. 7. Run a line of glue under the base of the ears. Press the base to the top of the egg like a hairband. 8. Punch two holes in the black craft foam. Glue them where you want the eyes to be on the egg. 9. Cut a small rounded triangle from the pink felt. Do not glue it on the egg. 10. Cut off 8 inches of monofilament. Fold it double, then fold again. Tie a knot in the middle. Cut the ends of any loops so they separate. Place a dab of glue on the knot and adhere the pink felt. 11. Place a dab of glue on the egg where you want the nose to be. Adhere the nose piece. 12. Tie a piece of colored twine into a bow, and glue it at the front point of the egg in front of the ears. Set the egg in a small crate of smaller plastic eggs or fake grass.